It’s Wednesday. Half of your week has ended. The weekend is that much closer. And better yet: there’s a brand new Albert the Alien to greet your day! 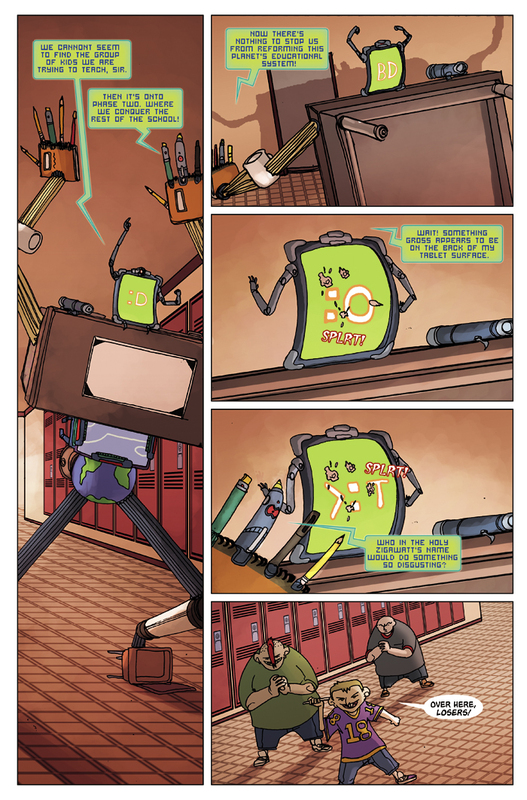 The Giant Alien Mecha School Supply Monster continues to roam the hallways looking for the kids, but when it cannot find them it starts to set its sights on another task: taking over the school’s educational system! However, they are interrupted by the kid’s plan – which involves Wally being the bait! I remember spit wads being squished pretty well in my school. I think maybe one kid got in trouble for them in elementary school, and they were outgrown pretty quickly after that by the rest of the class. Which is a good thing, because spit wads are gross! What are some other gross things kids did in school?